This is Meaghan. She's a badass stylist, a colleague in the plus industry and my friend. Recently, Meaghan crashed at my Los Angeles apartment while working award show season. Normally, my two-bedroom casa is pretty quiet... but not that week. Jam packed with beauty bloggers in town for a conference, Casa de Sapora was aflutter with electric pink Beauty Blenders, curling wands and lots of clothing. All these extra houseguests meant my darling friend was bunking it up with me in my room. 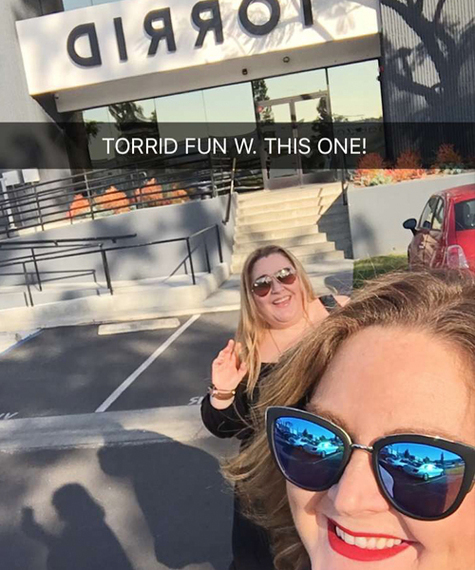 In the process of our shacking up, and in between her endless runs back and forth (and back and forth again) to West Hollywood showrooms, I was afforded a glimpse at the inner working of her day. I observed her. I noted her daily behaviors. Like a David Attenborough-narrated National Geographic special. Cue British-accented voiceover... "And now we see the daily routine of the species Humanis Fashionis Stylistus, living in the wilderness worldwide but often found centrally located in the metropolitan of New York City, Milan or Paris. See how she lives and breaths in utter fashion perfection at every moment of her life!" I'm a super casual person. And, though I work in plus fashion, I consider myself to be a behind-the-scenes kinda gal. I'd trade stilettos for cowboy boots any day of the week, I throw my hair in a top knot five of seven days a week. I'd describe my style as comfortable and feminine. Meaghan? She's on the front lines. And, while we have a shared passion for hard work and a common intensity to our professional style, I found that there were some simple yet profound differences in how we conducted our daily lives. These are four of the things I learned from living with a stylist. 1) Your all black outfit doesn't need to be boring. Ever. 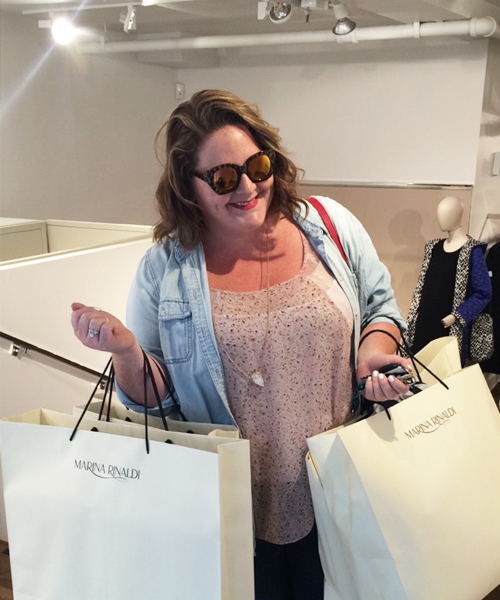 Meaghan and I took one day to visit with an array of brands. We both donned the black "uniform" so many industry people adapt. Yet, our looks were FAR from matchy-matchy. I kept my look super simple, with a peasant-inspired dress, cowboy boots and a skinny, faux-snakeskin belt. Meaghan, went full on glam-casual with a black strapless jumper, long vest, and white strappy stiletto sandals. White shoes? After Labor Day? With all black? Ummm yesssahhhhhhhh! 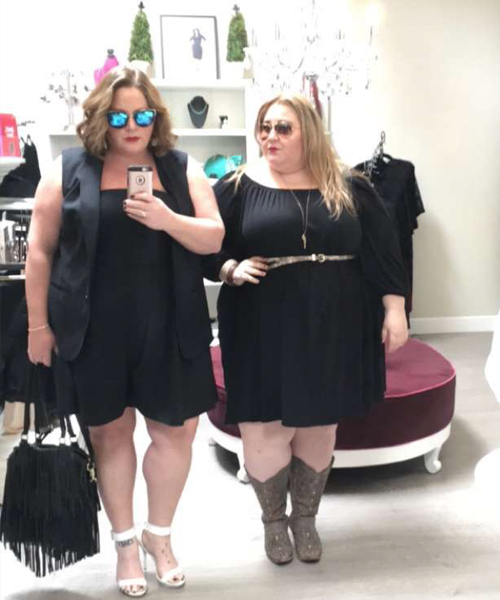 Meaghan and I taking a standard blogger-mirror selfie. Note her fancy shoes and my... cowboy boots. The moral of the story? If anyone tells you that wearing all black is boring... they lack vision. No, really. An all-black outfit is a blank canvas for you to paint your own personal style to life. Take 10 women, tell them to wear only black, and I guarantee each one will look unique and rock her own distinctive style. Add pops of color, play with texture and layer it up. An all black outfit will leave you looking chic at any age, any size and any style. An all black outfit will leave you looking chic at any age, any size and any style. 2) Bold lipstick saves the day. There wasn't a day on her trip that Meaghan didn't swipe a bold color over her lips. Even the days when she kept her outfit super simple (with kicks and rolled-cuff jeans) and ran out the door faster than a speeding bullet, Meaghan opted for a bold lip. At first I wondered why, but I quickly gleamed it was because the bold lip made her look instantly polished. 3) Never leave the house without looking polished. Sometimes I walk the dog in my pajamas. Don't judge me, you probably do it to... The first time Meaghan saw me do this, she stopped in her tracks, raised an eyebrow and said, with equal doses of horror and love. "You're not going out of the house like that, are you?" She questioned. "If you die right now, just remember that's the Ghost Outfit you'll have to spend eternity in." There wasn't a moment when we were outside of the house that Meaghan didn't look pulled together. At home? A totally different story; think house muumuu, makeup free and proud. But outside of the confines of the house? Full makeup, full outfit. Every. Single. Day. As a stylist, Meaghan knows that her clients, and every person she touches during her work day, are looking at HER as an extension of her work. From the publicists handling jewelry pulls to contacts at fashion brands to the friends of her celebrity clientele. For a stylist, your style is essential. And, while it isn't necessary for her to be endlessly glamorous, it is essential for her to have the physical equity that killer style and a strong presentation grants her. I'll make a mental note to remember this as I reach for my pull-on black pants and Ugg sneakers for the second time in a single week. Six hours into our day and she's still looking polished with her red lipstick. Me? I look like Bridget Jones got caught in a hurricane. 4) Make the bed every day. I tend to be a running-behind kind of gal. While I'm never actually late, I end up sacrificing self-care in order to maintain my schedule. I'll forgo breakfast, skip a lengthy grooming process and, even, sometimes, leave the house without making the bed. Not Meaghan. She makes the bed each and every morning. "When I make the bed, I start the day out in order," she explained. Is this brain science? No, clearly. But what it does is assure you start your day taking a few minutes for yourself. It forces you to put off the email, keep the social media at bay and relish the rituals of self care that so many of us (myself included) forgo. Also, it makes coming home at night after a long day a heck of a lot more appealing! At the heart of Meaghan's rituals are one distinct theme - take time to take care of you. Just a few minutes. At the heart of Meaghan's rituals are one distinct theme - take time to take care of you. Just a few minutes. Enough to swipe on a lipstick or throw a more pulled together (yet just as comfy) alternative to sweatpants. Enough to think outside of the box and take a basic black look and pop it to life with snappy accessories... Enough time to make that bed a beautiful haven of pillowy-soft, welcoming comfort to collapse into at the end of a long day! And, in case you were wondering... Since Meaghan left, I've adapted the bed-making and lipstick. Pry me from those Ugg sneakers? I dare you to try.